Special Rules: Flamethrower unit is a single stand and takes only 2 hits. It has a range of only 2 squares (hexes), but has a fire factor of 80% against ALL targets. Target checks morale with a penalty of -10; -20 if Chariot, Cavalry, Camelry, or Elephant. The Flamethrower has no melee combat factor, and is destroyed if forced into melee. However, any unit attacking a flamethrower must undergo a flame attack (and morale check if it suffers a hit) once it reaches 2 squares range, unless it attacks from the flank or rear. The Flamethrower my use skirmish retreats also. Elephants are first degree Disorganized within 2 squares of a flamethrower. 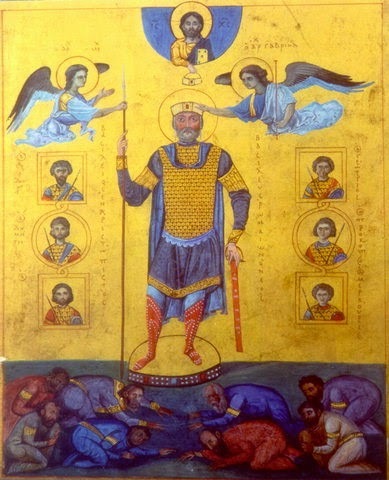 Byzantine Scutatoi - Heavy Infantry with long spears and large shields. While secondary to the cavalry, the Byzantine army retained a core of well drilled, steady infantry until late in its history. A second unit of Scutatoi; they typically served more as a rallying point and base of operations for their cavalry rather than a direct offensive role. Like most of this army, these are 25mm Garrison figures. Varangian Guardsmen - these troops became part of the Byzantine army as early as 874, initially being composed of Rus from Kiev. 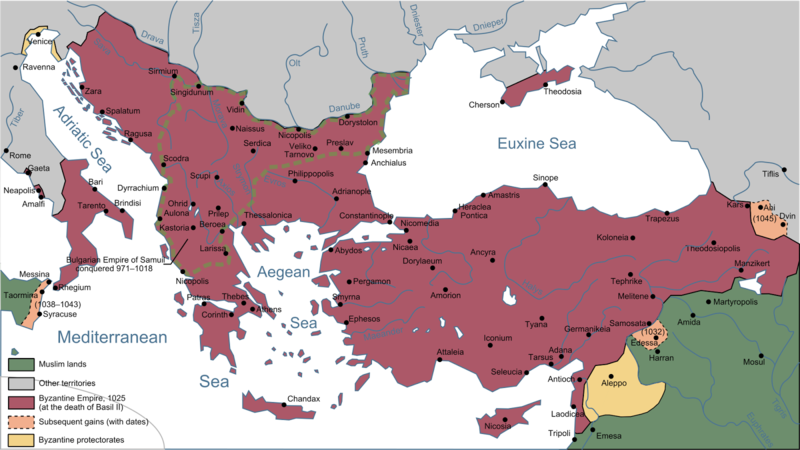 They became official Guardsmen under Basil II in 988. In later years their members came chiefly from Scandinavia, and then , after the Norman Conquest of England in 1066, Anglo Saxons. Although the sword and bow were often used as well, the hallmark weapon of the Varangian guard was the long, two handed axe. Indeed, the Varangian Guard were often referred to as the "axe bearing Barbarians" by Byzantine writers. These Byzantoine Psiloi are armed with an early form of Crossbow. It is unclear how effective they were; in later years, after exposure to Western European troops armed with more modern crossbows, those were adopted in limited numbers.. These archers wear some mail armor, and were usually deployed with the Scutatoi to provide supporting missile fire, especially needed to combat enemy horse archers. Siege operations would be another typical employment for these troops. Such troops might come from the provinces of the empire, and/or hired as "barbarian" mercenaries. While primarily used at sea, and to a lesser effect at sieges, it was used in the field at times as well. it is such a unique weapon that I had to include it in my Byzantine army (and rules)! Byzantine Klibanophoroi; "Super Heavy Cavalry" in wargames terms. Although slower than other cavalry, their effect upon enemy troops could be devastating. Both horse and rider were heavily armored, and the long lance was their primary weapon, although bows were also often carried. Byzantine Katafarktoi were somewhat less heavily armored men on less heavily armored horses; I have depicted them as combined with Koursores, cavalry men with torso armor riding unarmored horses. These troops also had an excellent balance of shock and firepower, the later from the powerful composite bows that were carried. These troops were the chief strength of Byzantine armies for centuries. I do still like these Garrison figures. These fellow are Byzantine Trapezetoi, an indigenous ("Roman") form of Light Cavalry. Armed with long lances and Javelins, it seems heir chief role was to chase off more lightly equipped enemy horse archers. Another unit of Byzantine cavalry - I think these fellows are Old Glory figures, and were added much later. I'd like to say that the "weathering" on the flag was intentional, but about 10 years ago heavy spring rains caused the first ever flooding of the basement of our home, where all my wargames stuff is - the water got about 6" deep before we could pump it out over several days. As most of my stuff is at least 4" off the floor, the damage was minimal. However, moths later I discovered that the flood water had entered the inverted lid of the clear plastic boxes these troops were stored in,. and the prolonged moisture had allowed mold to grow on the paper items, like the flags. I made this unhappy discovery the evening before I was to depart for Historicon as I was loading up the troops into my car. this lead to a very long night re-basing the sodden troops, and then flocking them in m,y hotel room in Lancaster the evening before the game. The Byzantine Emperor is by Garrison. When the Emperor was a military man or had interest in military affairs, the Empire usually did OK with maintaining or expanding it territories. When he wasn't. the results were usually not good for the long term integrity of the state. There are a few a few odds and ends Cavalry here, which are Garrison. The sub commanders are from Old Glory. Turkish Light cavalry, serving as mercenaries in the Byzantine army. There are 50% Garrison and 50% Old Glory figures (the somewhat larger ones). Ready... arrows! I think these are Garrison figures. A few more Psiloi, this time slingers, to bolster the Byzantine forces. The lack of flocking means they were flood survivors as well! These are Garrison figures once again. I have one more unit of Old Glory Byzantine HC, but I still haven't gotten around to repairing the flood damage they suffered, so they don't appear here. When the flooding repeated itself the following year (after 15 preceding years of dry basement), a sump pump was installed - no more unplanned aquatic exercises down there now! Basileus II, Byzantine Emperor (976 - 1025). Also known as Basil II, "the Bulgar Slayer". In the aftermath of the debacle of 1806 and the subsequent treaty of Tilsit, the territory of the Kingdom of Prussia was cut in half, and its army was even more drastically reduced. From a starting strength off 55 Regiments in 1806, there were to be but 12 Infantry Regiments (including the Garde Regiment zu Fuss, originally numbered as #8). The final composition of these regiments was set on December 1, 1808. Each regiment was to have 2 battalions of Musketeers and one of Fusiliers, each of four companies, plus 2 companies of Grenadiers, which were brigaded separately to form Grenadier battalions. 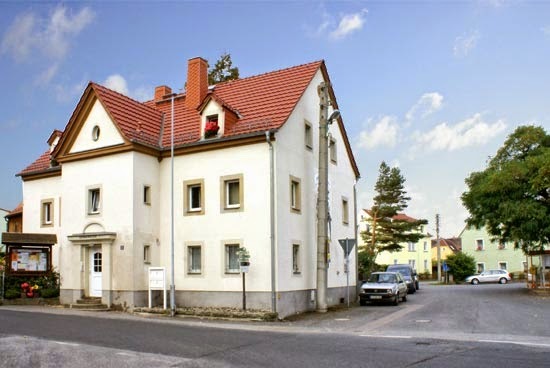 Each company had 5 officers, 12 NCO's 20 Gefreite (a uniquely German designation for senior/distinguished privates in line for promotion to Unteroffizierre [Corporal]), 115 privates and 3 musicians - 155 men per company, which was to be augmented with yet an additional 50 privates upon mobilization. * The Leib Grenadier Battalion had a unique organization, all four companies coming from IR #9, "Leib-Infanterie"). The 8th (Footguard) Regiment retained its Grenadier companies with the regiment itself. 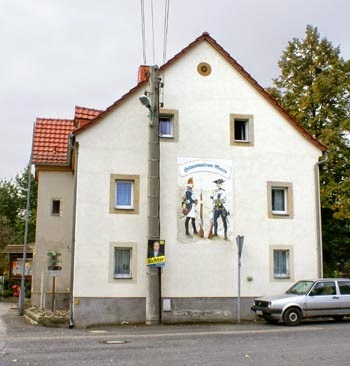 The Zweites Ostpreussisches Grenadier Battalion. The facing color for East Prussia is variously described as "Brick Red" or Dull Orange. These are the 28mm Lancashire Games figures seen (unpainted)earlier this month. 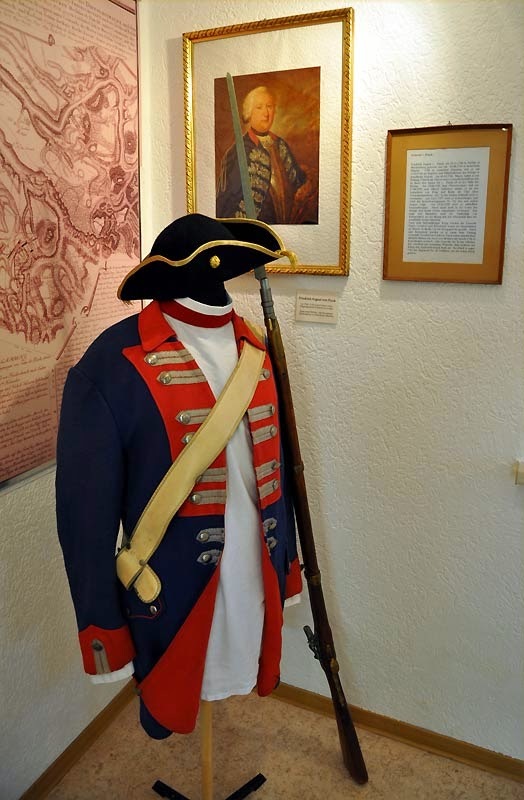 The Grenadiers, when wearing full dress as seen here, had the tall black busch plumes on their shaklos; NCO's had the lower 1/4 of the plume in white, while drummers/musicians had their busch in red. The Prussian Grenadiers were used as front line combat troops rather than being held in reserve, and saw much action in 1813 and 18914. The Lancashire Games figures come with a rather large number of variations on the "Advancing" pose, randomly supplied - I counted 5 poses, many with head and/or equipment sub-variants. They ate large figures, close to Front Rank in size. Although it's hard to see, especially with the characteristic Prussian habit of wearing the grey great coat rolled and slung across the chest and left shoulder, the shoulder straps have two different colors, reflecting the two different regiments the Grenadiers were drawn from - half have light blue (from the Viertes Ostpreussiches IR), half have yellow (from the Drittes Ostpreussisches IR). This four stand unit is the Schesisches Grenadier Battalion. It has the yellow facings of Silesian units, and is composed of variants of the "Firing" pose packs from Lancashire Games. If you look closely you'll see some of the pose, head, and equipment variants. The Grenadiers should have a brass eagle plate on the front of their shakos, while the Line infantry shakos have the Royal Cipher in brass on the front. However, these figures have (very nicely sculpted) "Guard Stars" on the fronts of their shakos, which would be appropriate to the Footguards (in silver). I debated how to handle that, and decided to just keep the stars and paint them in brass. Purists beware! As I've noted before, I like some of my Napoleonic infantry in "Firing" poses. In perverse contrast to the above, larger unit, for this one I kept the shoulder straps all in just the red of a single (Zweites Schlesiches) parent regiment. 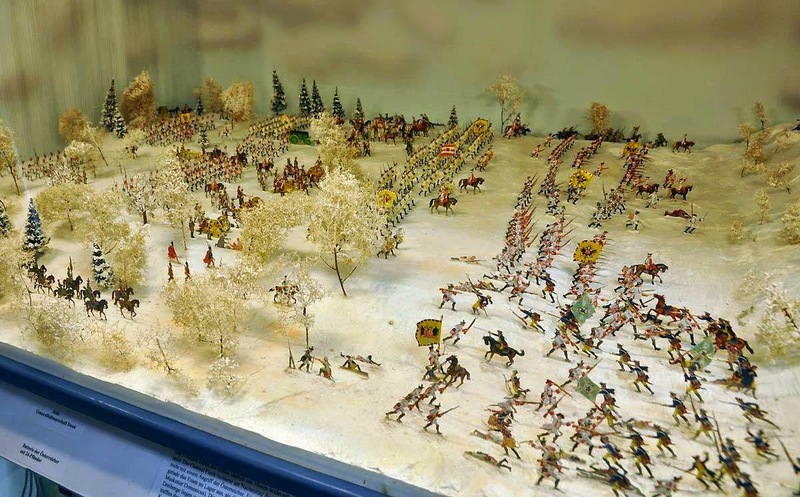 "I stumbled upon the battle of Kesselsdorf just west of Dresden, and the "Finckenfang" in Maxen, just south of Dresden in the third Silesian War when the Austrians won the battle and captured Prussian General Finck. Was in both small towns (villages) recently, both quite nice. 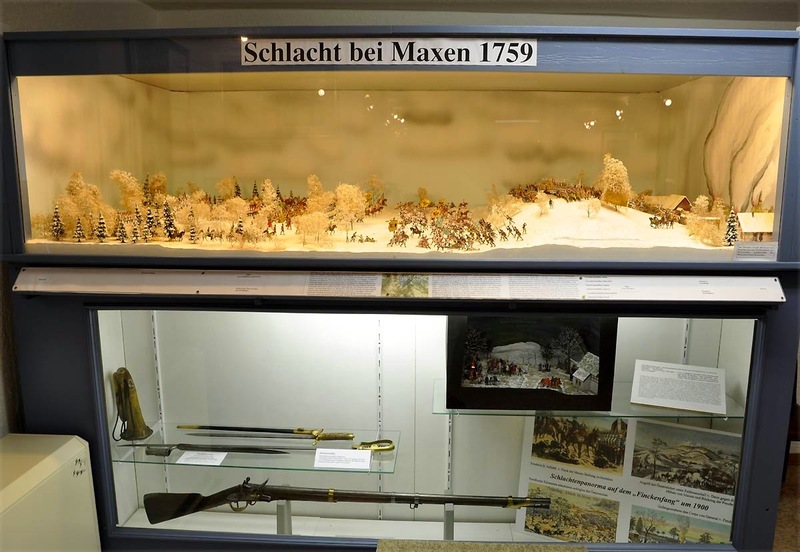 I'm going to attach some pictures taken in the museum in Maxen, they have a nice exhibit on the battle." "From July 1759, Austro-Imperial forces proceeded to the invasuion of Saxony, capturing Dresden and several other cities.Prince Henri <of Prussia> soon led a counter-offensive which allowed him to retake possession of most Saxon towns with the exception of Dresden. On November 13, King Frederick II (Frederick the Great) arrived from Silesia where he had operated against a Russian army and made a junction with the corps of Prince Henri. Copunt Leopols Daun , the commander-in-chief of the Austrian forces, gradually retired towards Dresden, closely followed by Prussian forces. On November 15, Frederick detached Finck's Corps to Maxen to cut off the communications of the Austrian Army with Bohemia. However, this manoeuvre placed Finck in an isolated position. Daun resolved to encircle and attack Finck's isolated corps." 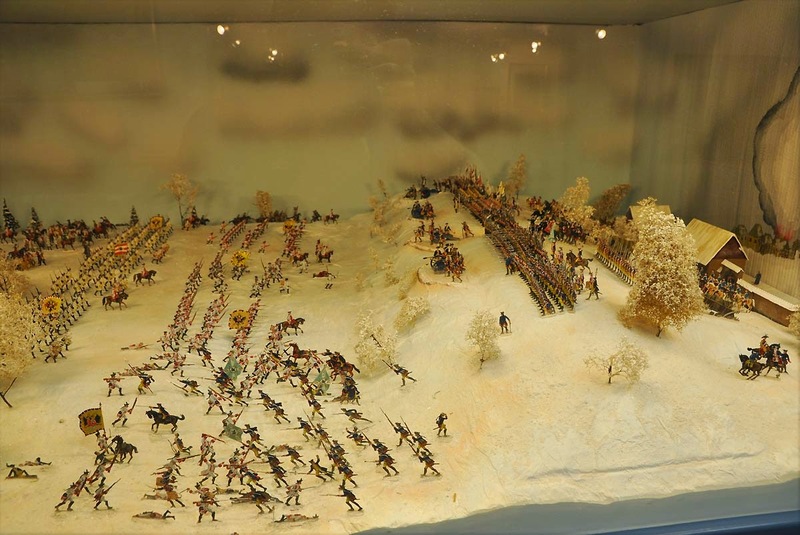 More of the diorama at the Heimatmuseum-Maxen, as photographed by Ingo. The battles of Friedrich der Grosse were one of the inspirations for the development of Zinnfiguren in the 18th century... I must resist getting pulled into another period almost as vast as the Napoleonic Wars! Another display from the museum - the plates looks like ones from Funken by their style, as opposed the the Knoetel plates one might expect to see! The outside of the museum. From its website, admission is free, but it is open only very limited hours. The side of the Museum building also gives a hint of what lies inside. The last two images from this short tourist guide article on the museum. Re-enactors at Maxen during 2009 - the 250th anniversary year of the battle. The surrounding countryside looks beautiful, too! 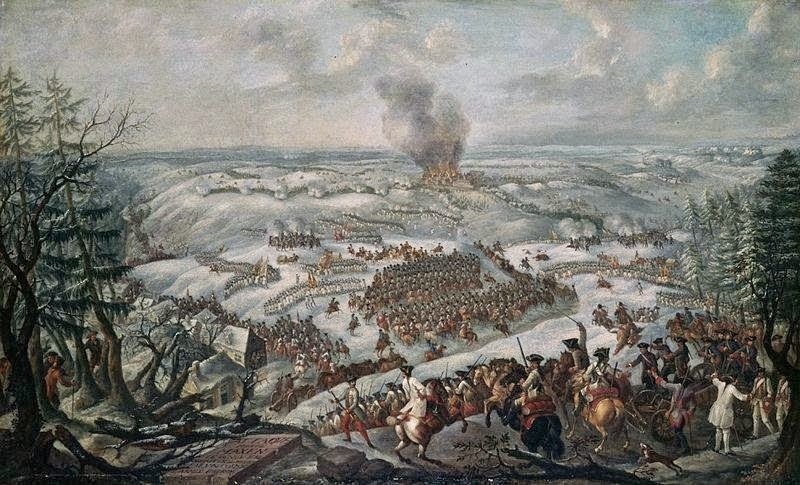 Painting of the Battle of Maxen. It hangs in the War museum in Vienna, celebrating one of Austrian Feldmarschal Daun's great victories. 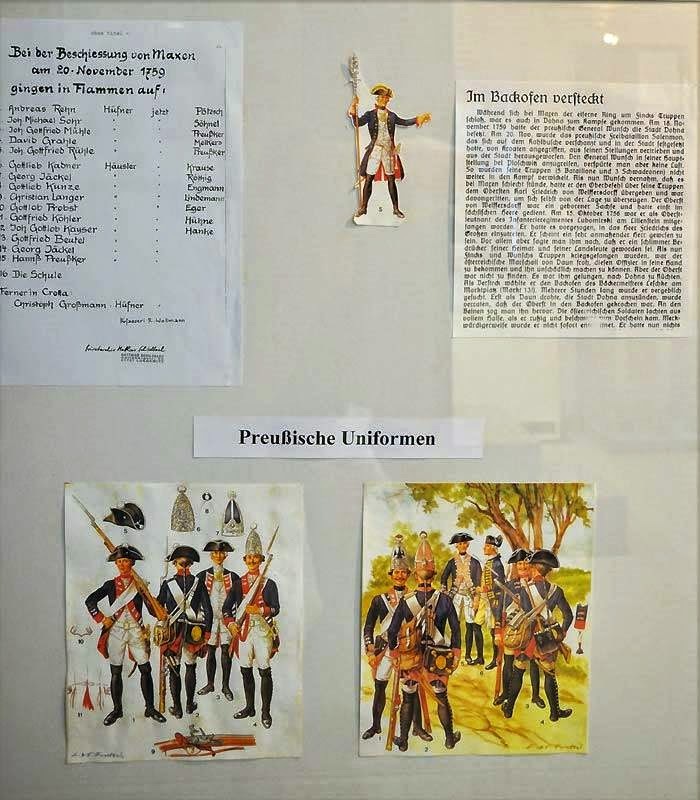 Well, it turns out that I did once start a 7 Year's War project over 25 years ago, and here is the proof - this one unit of Prussian Musketeers! I believe these are 25mm Garrison figures; I think I also have the lead for a unit of Prussian Cuirassiers and a Prussian foot battery somewhere, also by Garrison. With no one else in my group being interested in the 7YW, this one unit was as far along as the project ever got! I don't even recall which Regiment these troops represent. Oh, and I would stick to just Prussians and Austrians for once!